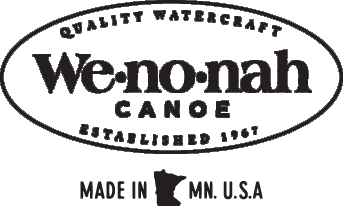 Down River canoes are remarkably versatile and give you a solid advantage in all kinds of fast moving water, from the shallow sweeps of prairie rivers like the Niobrara to the meandering currents of smaller rivers like the Root River in Southeast Minnesota. These versatile boats differ in capacity, but all have at least two inches of rocker, generous flare to the sides and depth in the hull. More rocker equals greater maneuverability – a valuable characteristic in moving water. It also softens the effects of crossing sharp eddy lines, where contrary currents tug at your canoe. Down River canoes are also deep enough to run dry in lesser grade rapids and stable and seaworthy enough to not be bothered by external forces when handling quick moving waters.